A few blocks from my house, a single city block has 3 dog “spas”. Even a hint of rain or snow and suddenly the side walks fill with embarrassed canines sporting expensive boots and slickers. I gawk in disbelief as I spot dogs being pushed in custom carriages, or carried in expensive totes. The streets of my city resemble Paris, where dodging doggie doo is an art. Clearly North America has embraced this re marketed dog culture, a new badge of status and wealth. Estimates put the worlds feral dog population at 600 million. In Bali alone there are half a million stray dogs, with 30,000 dog bite incidents last year. The WHO ( World Health Organization ) has issued a travel advisory for Bali, warning of the rabies problem. Rabies kills 55,000 people a year, almost all a result of dog bites. In Baghdad of the estimated 1.25 million strays, 58,000 were destroyed in a three month period last year. Mauling by feral dogs are common and in some parts of the world, becoming a consideration for tourists selecting a destination. In 2011 Americans spent over 50 billion dollars on their pets. 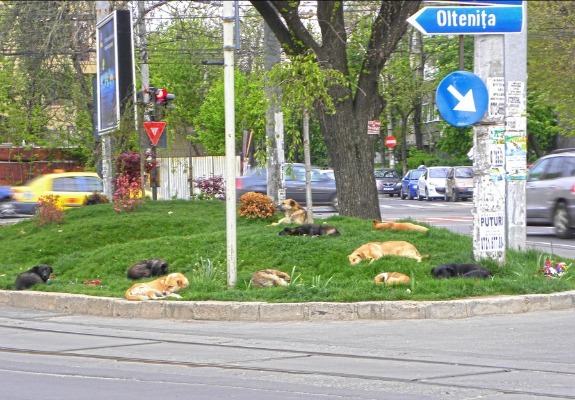 A pack of street dogs naps on a traffic island in Bucharest, Romania. In spite of a culling program, the animals swarm the streets—and occasionally maul residents and tourists. Photo courtesy of Flickr user cod_gabriel. This entry was posted in Uncategorized and tagged dogs, travel. Bookmark the permalink.